The historic city centre of Exeter has seen its fair share of chaos recently, with the catastrophic fire that ripped through buildings in Cathedral Yard, completely destroying the Royal Clarence Hotel. Caused by a ruptured gas main, the fire resulted in huge disruption, the financial implications and architectural costs of which are likely to be massive. It was during this time that Princesshay Shopping Centre, located in the heart of the city, was undergoing a comprehensive roof refurbishment project, with the help of our flagship refurbishment service, Sarnafil Plus. Even with the disruption from the fire, we made sure the contractor and the client had our complete support to get the job finished on time. The £230m shopping quarter officially opened to the public in September 2007 as part of the city’s biggest ever regeneration project. With over 70 shops, cafés and restaurants, including top high street names and independent stores, the months coming up to Christmas were incredibly important for Princesshay. Sadly, the roof of the centre which was installed nine years prior when the building was constructed, had caused various problems throughout its life. A foldable aluminium roof with a traditional zinc finish, the product had not provided sufficient waterproofing since day one and needed to be replaced. Princesshay required a solution that would offer longevity and peace of mind for many years to come, as well as fitting in with the aesthetics of the city centre. In addition, any work on the roof would need to be carried out quickly and without disruption to shoppers and businesses below. Wanting to make sure the roof was sorted before the busy Christmas period, building consultancy Workman LLP recommended the Sarnafil Plus package. Our team offered the client a trusted product to be installed on the roof, supported by the technical team and a fully trained contractor, backed by a solid 20 year guarantee. Workman LLP worked on the specification for the roof with support from our Sarnafil Plus team, making the initial survey and assessing the client’s requirements. Blocks K, G and H required refurbishment – an area of around 1500m². A Sarnabar system in Lead Grey was chosen, with a T fleece between the composite deck and the mechanically fastened Sarnafil S327-18EL membrane. On a smaller roof with a plywood deck, Sarnafil G410-ELF, an adhered system with a fleece backing, was specified. It was important to emulate the previous zinc roofs, as they matched neighbouring buildings and are in keeping with the city’s history. To achieve this, we recommended the roof was designed with décor profiles, making it look exactly like zinc, while benefitting from the durability of a Sika Sarnafil membrane. Western Flat Roofing Co was tasked with the installation of the system. A Sarnafil Registered Contractor, the company operates from St Columb in Cornwall and works on projects across Devon and Cornwall. 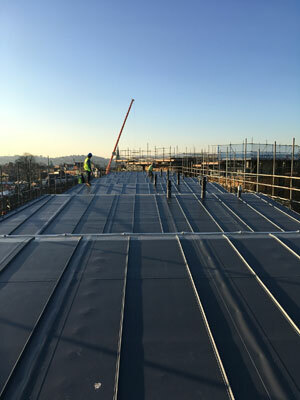 The Western Flat Roofing team, consisting of six fitters, removed the zinc roof and attached the new, fully welded covering, and swiftly resolved a couple of minor water ingress issues during inclement weather. Luckily, as the roof was not very old there was no insulation that needed removing, but at 17 metres above ground, located in the city centre, with a busy shopping precinct below, the roof installation was by no means a simple one. Careful planning of scaffold construction and material delivery was required to minimise disruption to all parties. As with many refurbishment jobs, patching up someone else’s work can sometimes lead to more challenges than anticipated. The Princesshay roof included mesh vents that had to be worked around rather than covered over, to ensure there were no issues with condensation in the roof cavity below. Interfaces with vertical zinc sections of the roof called for Sarnametal trims with a Sarnaplast seal to the zinc, creating a completely watertight bond. By far the most impressive part of this project is the speed in which it was carried out. Initially scheduled to take 14 weeks to complete, Princesshay required a faster turnaround to make sure that the Christmas shopping period would not be adversely affected. Unfortunately, the fire in Exeter city centre happened part way through the works, meaning that installation had to go on hold for a week. There was a worry that hot ash from the fire may have damaged the new roof. So to put the client’s mind at rest, we extended the guarantee to cover it and took samples of the membrane. Fortunately, there was absolutely no damage. 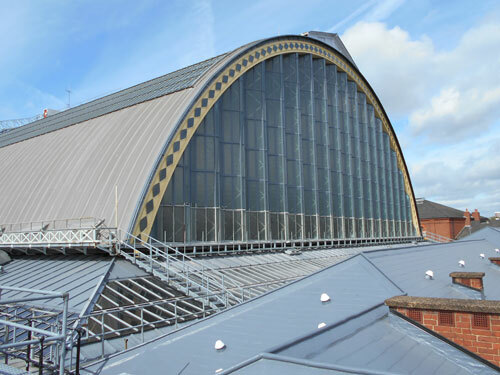 In an impressive demonstration of team work, Western Flat Roofing and Sarnafil Plus pulled out all the stops and the project took 13 weeks in total to complete, with nine weeks spent on the roof covering and the remainder on scaffold erection and striking. During the installation, we made more than seven site visits to support the contractor and ensure everything was running smoothly. Once works are finished we do a final inspection in order to issue the guarantee. More than just the icing on the cake, our Sarnafil Plus single point guarantee is a crucial part of why clients choose the service. We carry out a site inspection every five years to ensure the membrane is performing as expected. With virtually zero disruption to shoppers, the project has been a great success and the client has peace of mind thanks to the Sarnafil Plus service. As manufacturers and suppliers of high quality roofing membranes, it’s our responsibility to support the contractors that install our products, the clients that depend on their durability and the architects who specify us. It’s our commitment to always go the extra mile, and Princesshay is a classic example of this.